If you’re thinking of buying a home, but not sure on how or where to begin, let us be the ones to help you! What’s important is to ask the right questions in order to make the right decision – the one that’s best for you. First, if you’re a first-time home buyer, it’s important to get pre-approved for a home. This should typically be step one. Once approved, the rest of the home-buying experience can successfully follow. You can then answer such questions as how soon you’re looking to move, how quickly of a time-frame you’re willing to move in, or if you’re simply browsing your options, you can get a clear idea of what’s out there that’s within your price range. Are you looking for a home for yourself, for someone else, or for your family? What you answer to this specific question will, of course, determine a multitude of follow-up inquiries including location, size of home, and the accessibility to transit routes, highways, schools, hospitals and so on. Pets? What type of yard do you need? Or, how about the structure of your home? Having a pet might, depending, have an input in whether or not you purchase, say, a condominium versus a detached home. Upon answering these such questions, it’s important to consider the reasons why you’re choosing to move in the first place. At the end of the day, there’s always a reason – don’t lose sight of that. With this in mind, keep track of the homes you’ve seen and the features of each that you have liked. 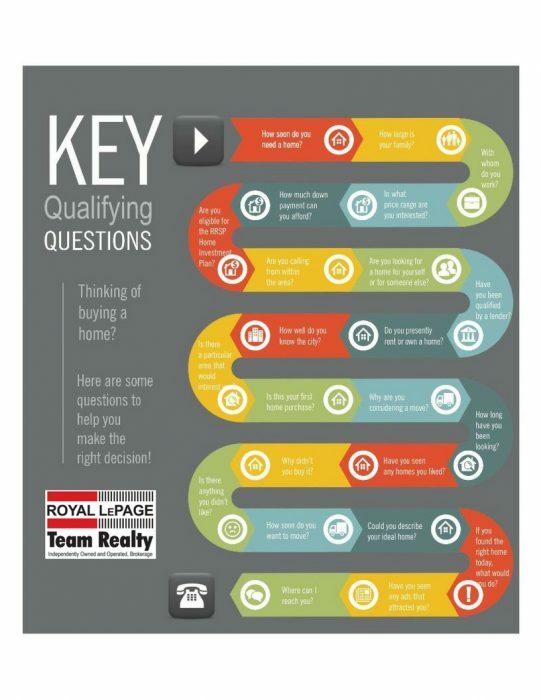 Take a look at more of our Key Qualifying Questions – our goal is to help you as best as we can so that you can make the decision that’s best for you.